You are currently browsing the category archive for the ‘India’ category. I love the picture above, because it captures something about the puzzle that is India. A beautiful woman laughs with her friends in the sunshine. 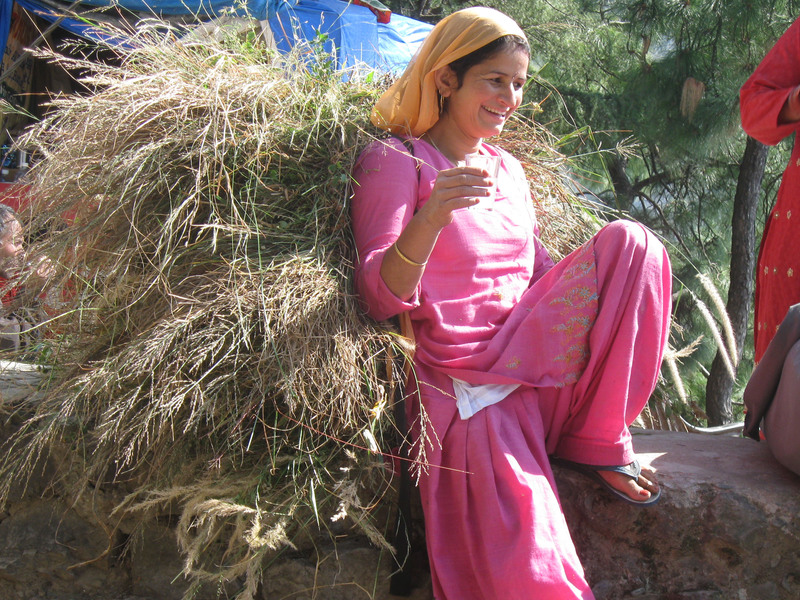 What isn’t so easy to see is that the pile of straw she leans against is strapped to her back for carrying. That must be heavy! By western standards, the lives of so many Indians should be miserable. But are they? Can we know? So often there’s visible joy, color, ornamentation, and dignity existing alongside toil, squalor and extreme poverty. How does it happen? Is there something fundamentally upside-down about our western view of happiness? One question that several people have asked me since I’ve been back is, “Was the trip life-changing?” I honestly don’t know how to answer that. I’ve only been back a short time. My suitcase is still not quite unpacked. It will take much longer to unpack all the visual memories, emotions, conversations, and experiences to see what, if anything, they mean. One thing is true: each time I travel, more of the world becomes “real” to me. It’s one thing to see images on tv or in magazines, but when I’ve been to a place, talked to people, and eaten their food, something changes. Now, when I read about flooding in Thailand or the latest sectarian violence in India, it feels like this has something to do with me. I feel a concern, as I would if I had relatives there. Because in a sense, I do. 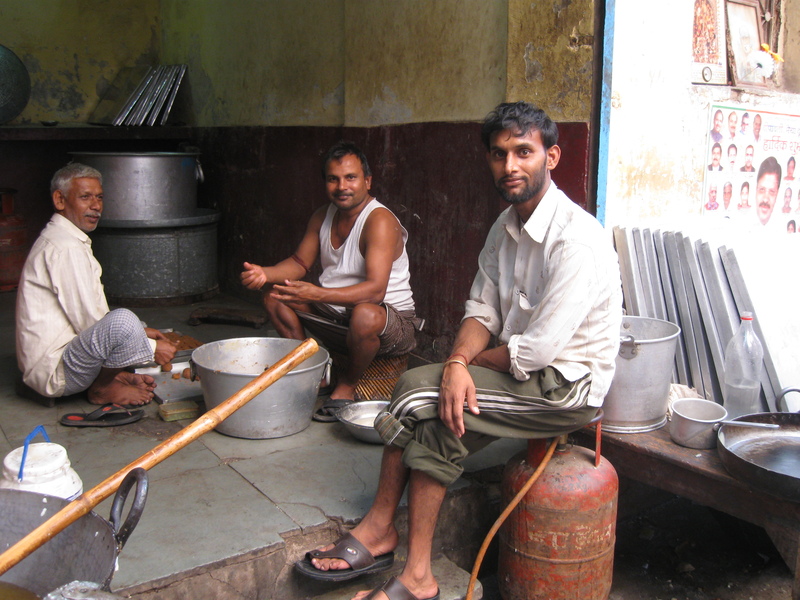 If you’d like to see my full album of pictures from India, click here. We chill out for five days. It’s a welcome break from constant travel and 5 a.m. wakeup calls. There are lots of western travellers in town, which means good coffee, cheap massages, and lots of food choices. Pizza! Cool temperatures and clean air! Ahhh! As we practice Zen, we hope to become more open, compassionate, and responsive. 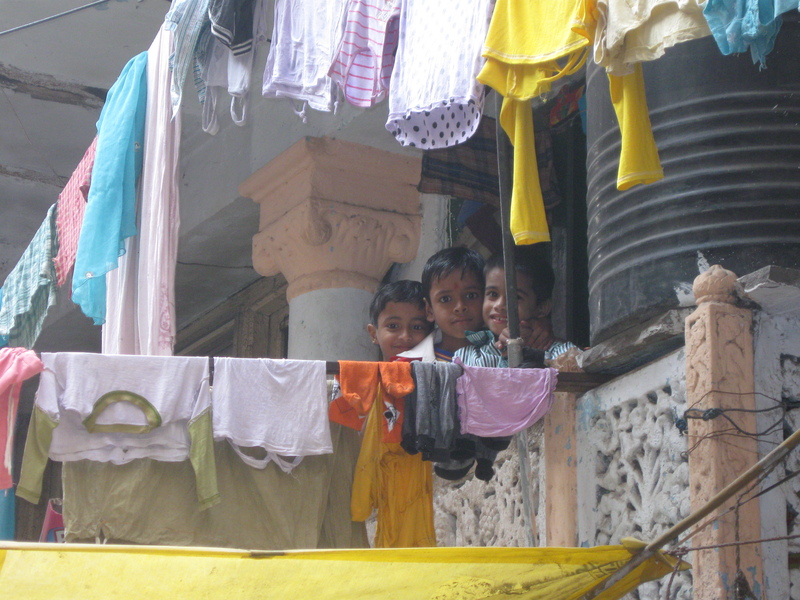 But how to respond to the poor in India – especially the children – is a conundrum that confronts every traveller. Most sources advise against giving money to beggars on the street. We saw a woman almost fall from the rush of children who surrounded her when she gave to a few. 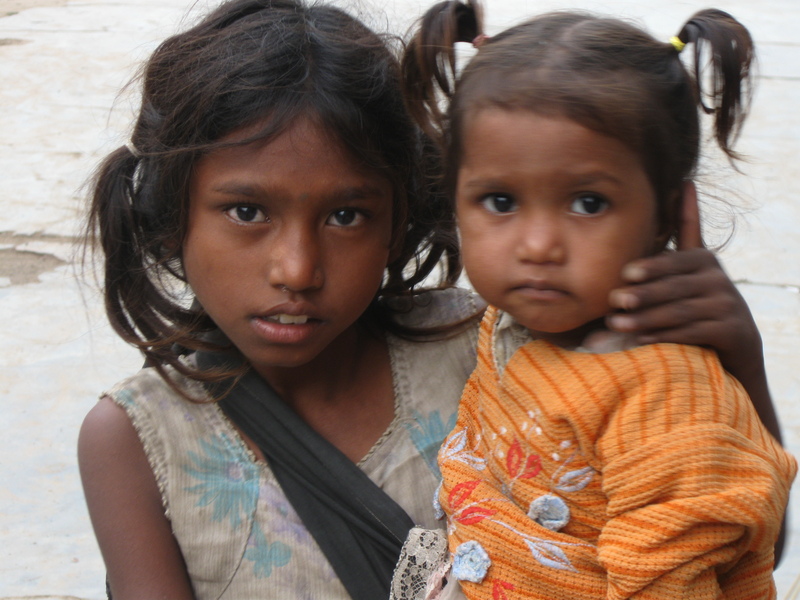 And aside from our own comfort, we probably aren’t doing these children any favors by giving them money directly. But what to do? It’s easy to barricade yourself behind a protective numbness. 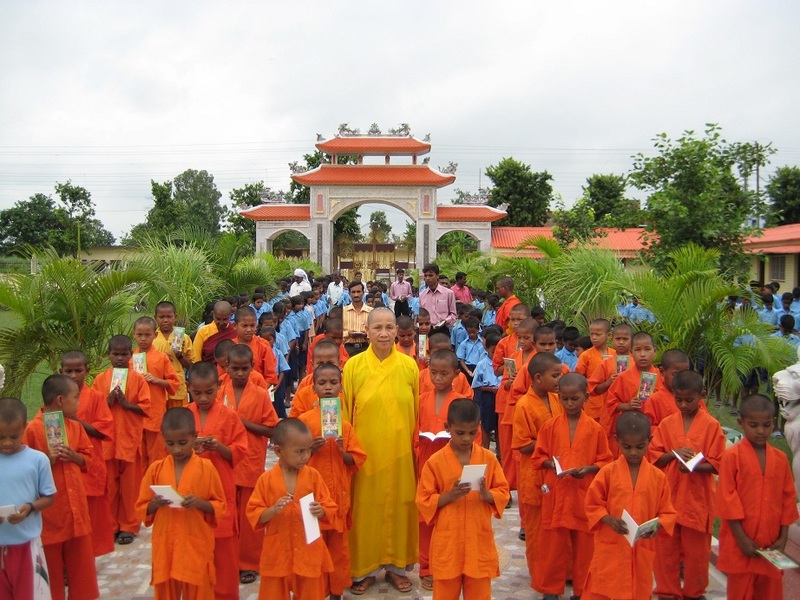 Here at the temple in Kushinagar where we are staying, we can see a different response in action. Rev. 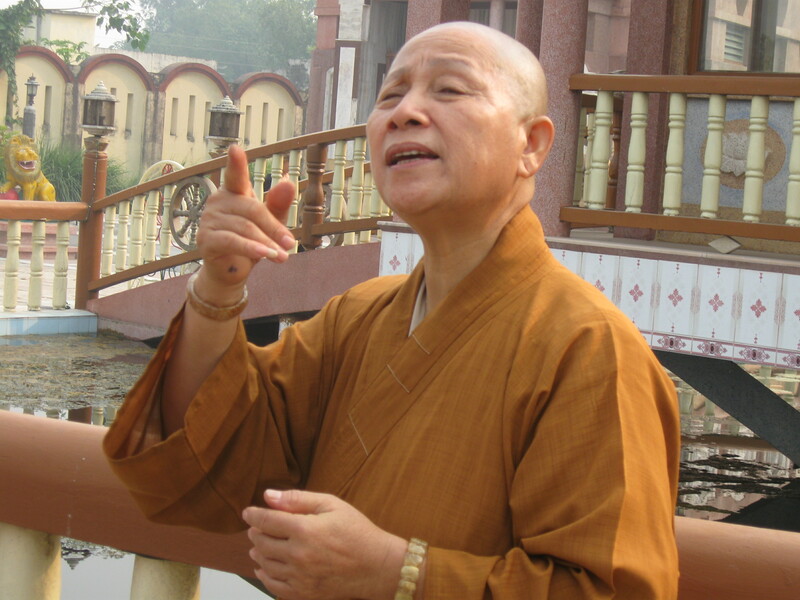 Thich Nu Tri Thuan, a Vietnamese Buddhist nun, came to India in 1989 and built the place from nothing. 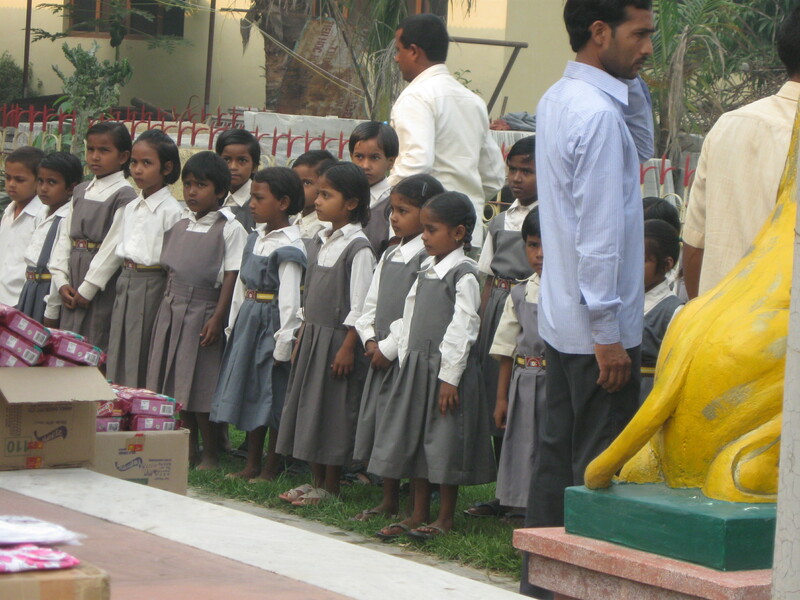 Through sheer determination, this petite force of nature created not just a temple, but also a school for some of India’s poorest children. 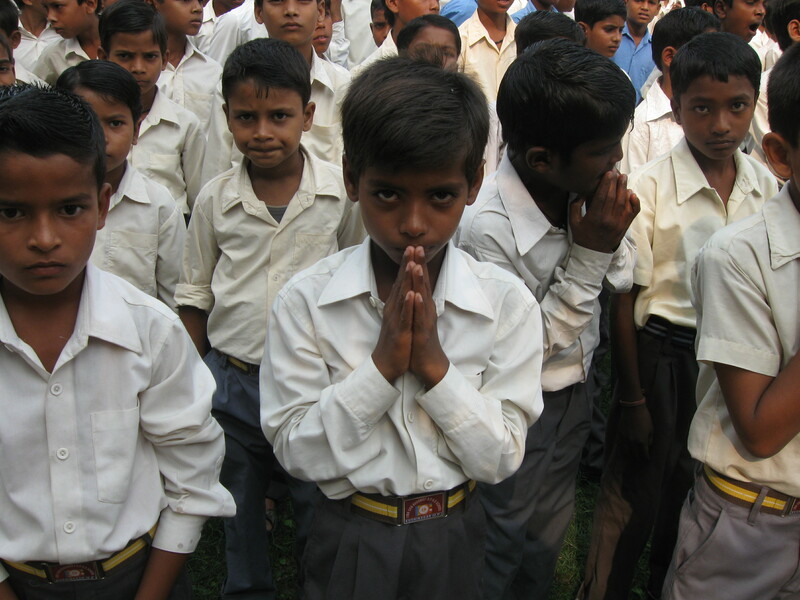 There are 335 children currently enrolled in the school, and over 6000 have been educated since its founding. 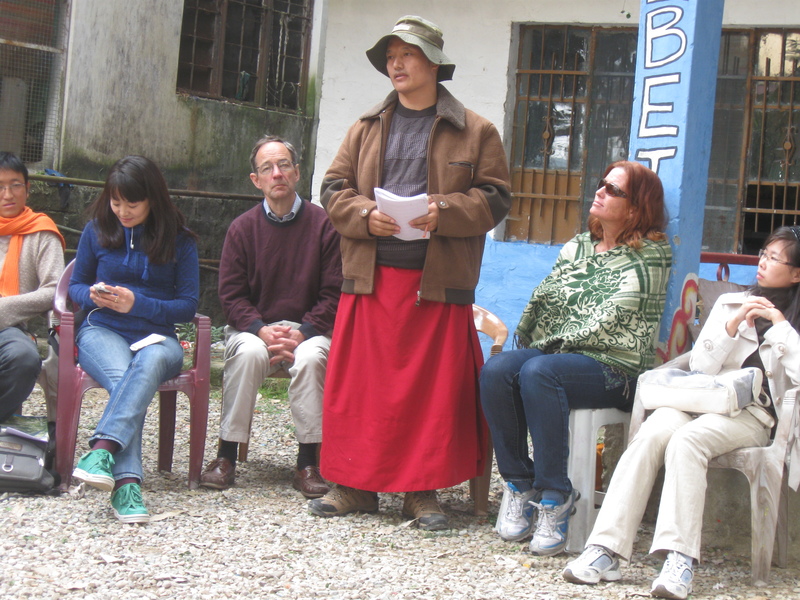 Before our arrival, the Kwan Um School organized a significant donation to the project. After an early morning visit to the site of the Buddha’s death, we returned to the temple for a hurried ceremony with the children. They waited politely while we passed out new uniforms and packages of cookies to row upon row of eager hands. It’s a small thing, but it feels good to do something. 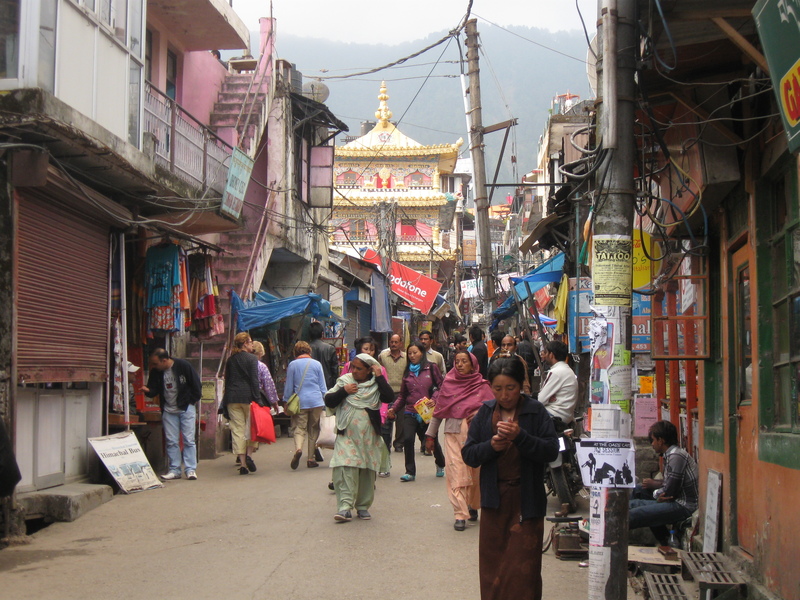 Then it was back to the bus for another 13-hour ride to Lumbini in Nepal, the final stop on our tour. As the hours went by, we passed from sociability, to boredom, to sleepiness, to silliness. The last leg of the journey was a push. 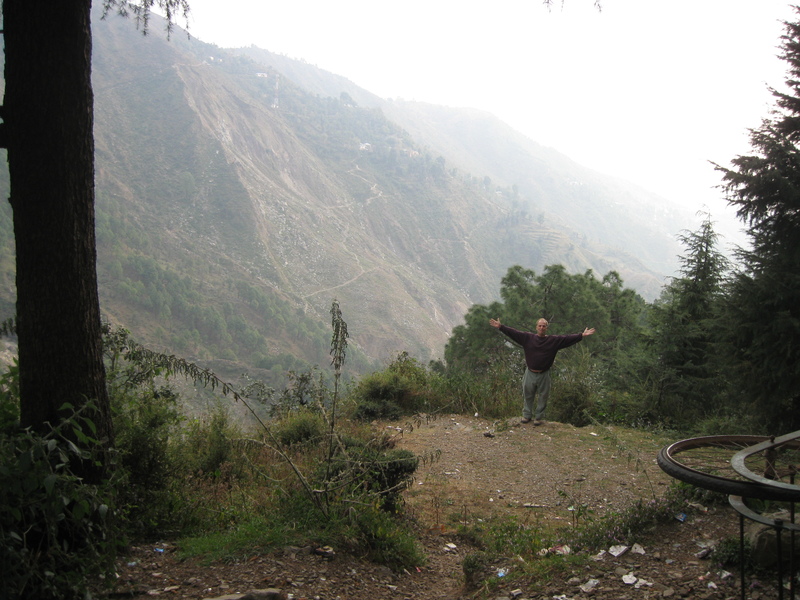 We sat idling in traffic at the Nepalese border for two long hours while visas were sorted out. Carlos and George started dancing in the aisle. Finally, music was pumped over the p.a., and we belted out Simon and Garfunkle songs in exhausted and full-hearted 100%-ness. We arrived at the Korean Temple during evening practice. The monks were chanting, and in the dark, the temple glowed with lanterns and candles like a huge jack-o-lantern. You are constantly breathing in dust made of finely-powdered human and animal feces, and also breathing toxic smoke from the countless trash piles burning in the streets. 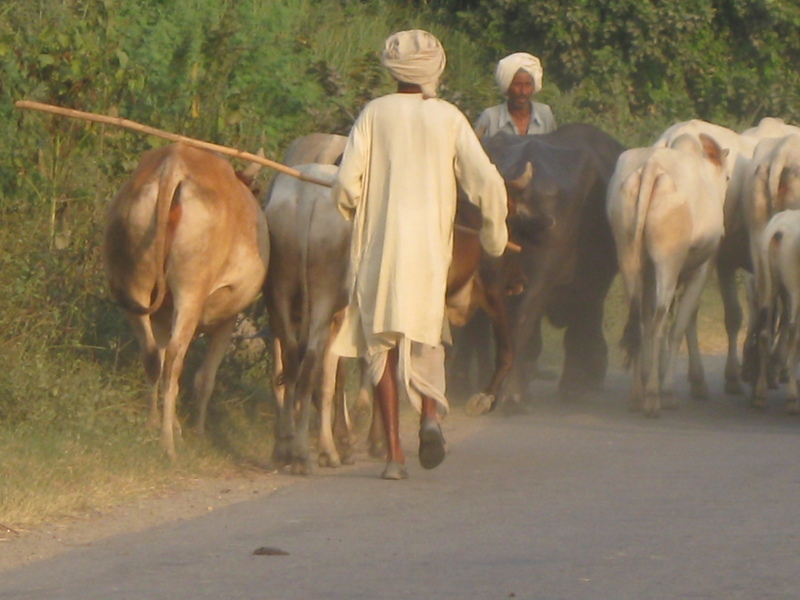 There are no functional sidewalks in most places, so a simple stroll down the street is a life-threatening adventure through crazed honking drivers, cows, dogs, and pushy peddlars. Because it’s hot, it’s easy to get dehydrated and have your electrolytes depleted. I can tell it’s happening when I feel an exhausted inner tremor. Everything at all times seems to be jerry-rigged and under construction. Take our hotel in Rajir, for example. Last night there was jackhammering on the level directly over our heads till 10:00 p.m. George finally went downstairs and yelled at the management. The jackhammering stopped, but some defiant banging continued for another quarter hour. The hardest thing, though, has been the length of the bus rides. India is just not set up for long-haul travel by road. I’m starting to brood about the long distances still to come. 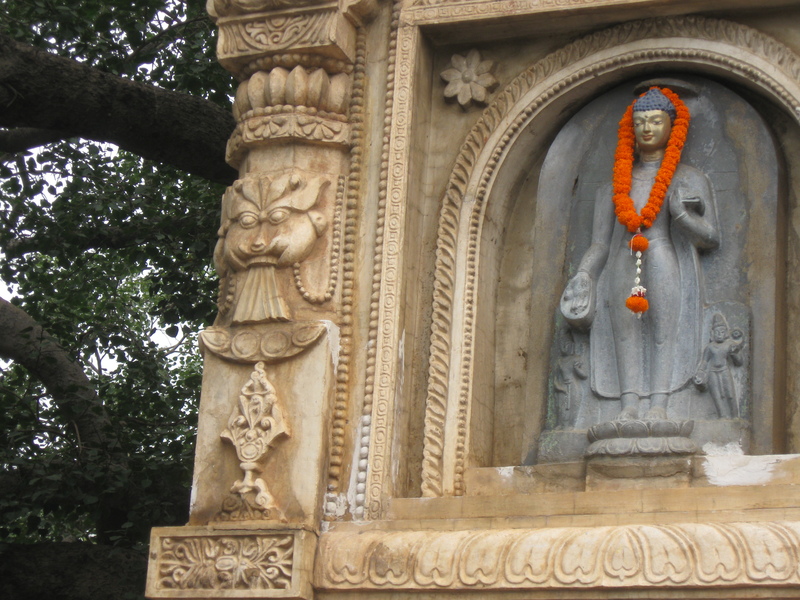 The trip to Kushinagar today started at 6 a.m. with an estimated arrival at lunch time. This was quickly revised to 3 p.m., and then dinner time. That time passed, and still we continued to bump along through the gathering darkness, surrounded by smoke and cooking fires. When we arrived at the Vietnamese temple after 14 hours of travel, everyone was exhausted. Diana and Maggy and I went to our room and I flopped down on the futon-like bed. 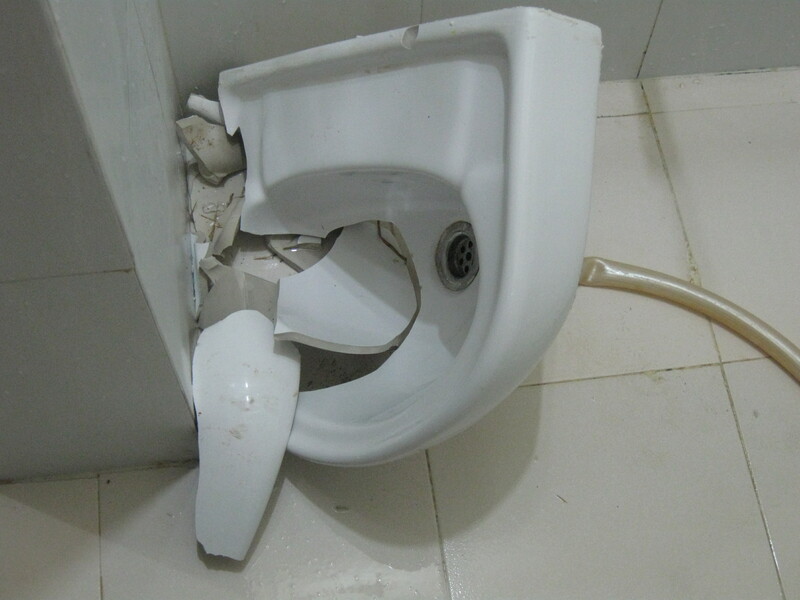 A moment later, from the bathroom, came an enormous crash. “Uh…you alright in there, Diana?” I went in to check on her and this is what I saw. The sink, which had been affixed to the wall with two small dabs of plaster, had flipped off at her touch and smashed to pieces. What could we do at that point but collapse into hysterical, helpless, snot-flying laughter? We laughed and laughed, and all the fatigue and difficulty sort of melted away. It was great. India is funny that way. The “bad” stuff and the “good” stuff seem to be inseparable. Which is a good thing, because no matter how remote the location, people instantly materialize from nowhere to enjoy the spectacle. These men and boys are watching the action from the road. 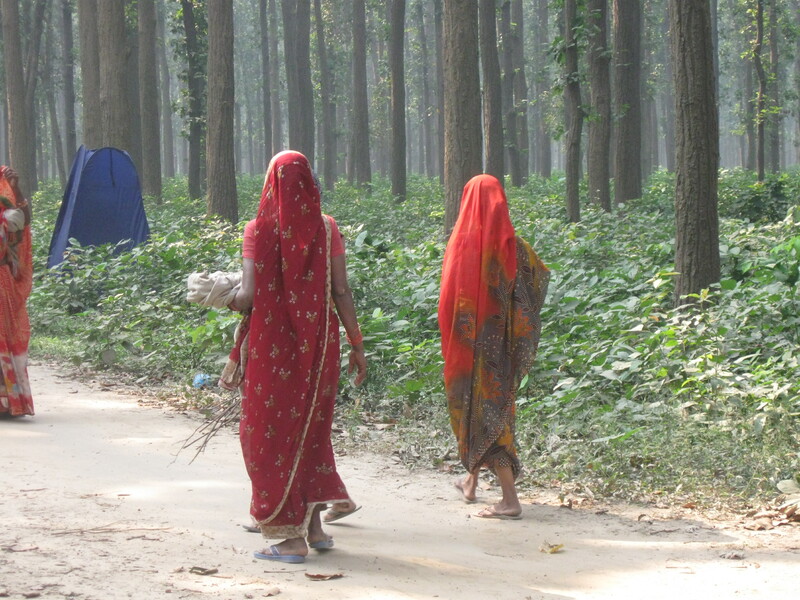 The women below, who are collecting kindling, came along during our pee stop in a teak forest. 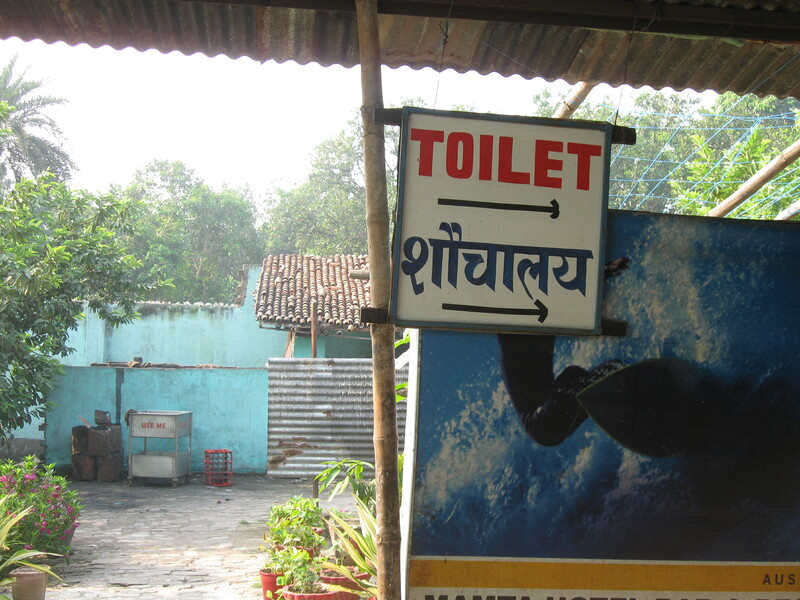 Elsewhere on the road, we have to come to terms with the Indian-style toilet. Western seats can be found here and there, but the norm is the squattie with a faucet and bucket for bottom-washing. (Toilet paper is strickly a bring-your-own affair.) Thanks to yoga and good knees, I’ve found this operation do-able and even sort of fun, once I got the hang of it. 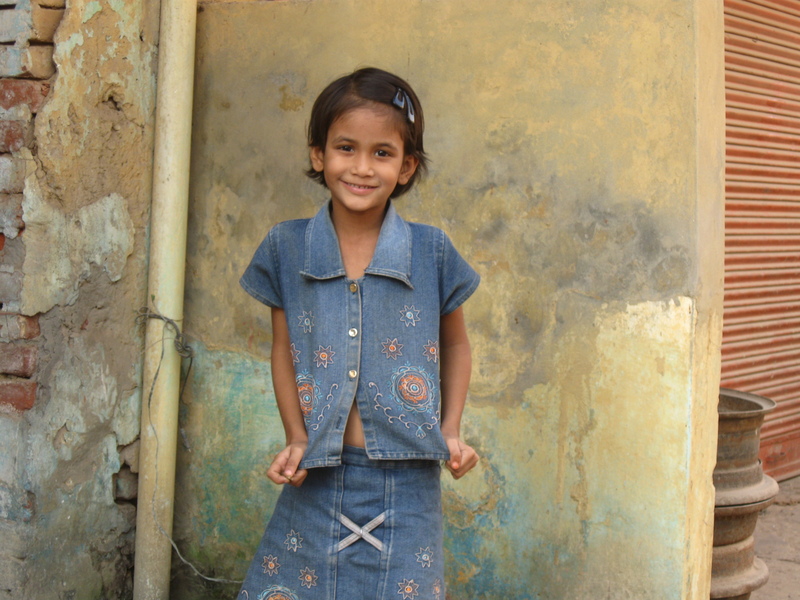 Here’s a video on how to use an India toilet, in case you’re curious. 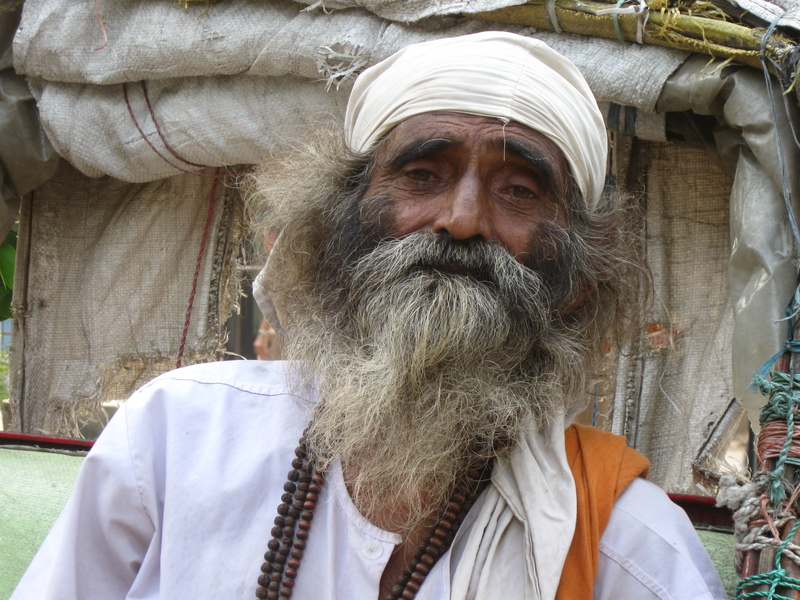 The video is posted on Breath, Dream, Go, a wonderful website for anyone interested in India. Leaving Varanasi. Trying to get out of the hotel driveway is comical…our way is blocked by a bedlam of wall to wall bicycles, motorbikes, herds of cows, rickshaws, taxis, and trucks. As the bus inches forward, we look down from our orange air-conditioned cocoon at people who are looking back at us. Some of the men look pissed off but many wave and smile. The women look wary. The young girls are the best. It’s a relief to finally be able to make eye contact. As we leave the city behind, the brown dusty smog is gradually replaced by smoky white haze coming from cow-patty cooking fires. Do Indians know the sky is blue? 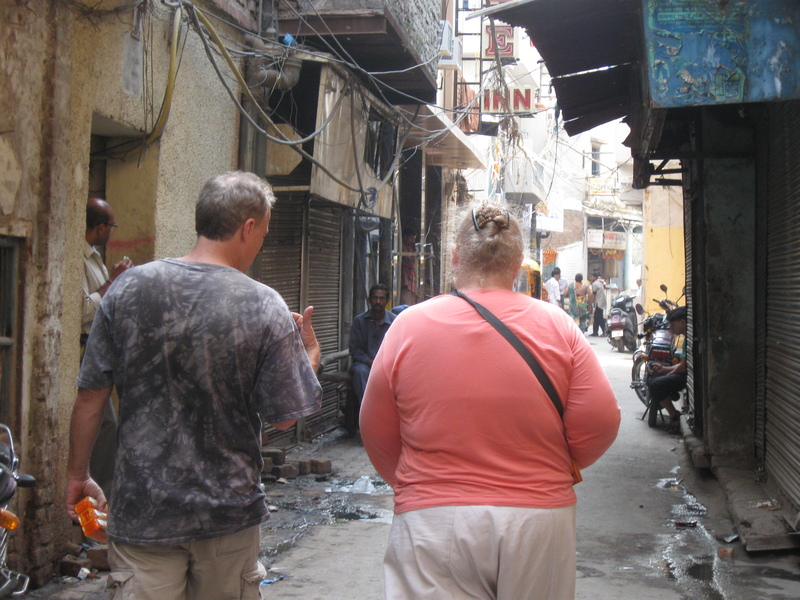 Our route takes us through many rural towns and villages, where life in conducted on the street. So many lives we get a quick glimpse of! 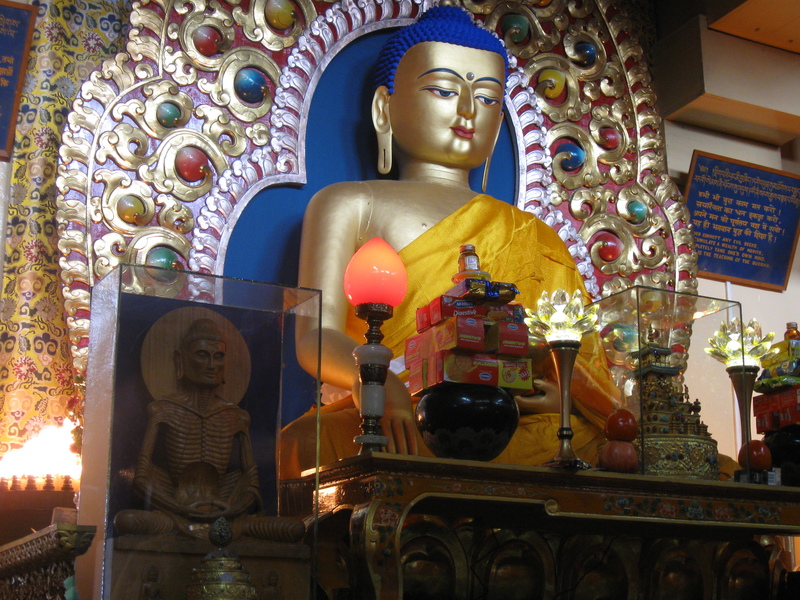 Bodgaya is a small town, home to the Bodhi Tree where the Buddha was enlightened. We’re staying in the Chinese Temple, which is wonderful despite the ultra hard beds (a thin pad over a wood platform). 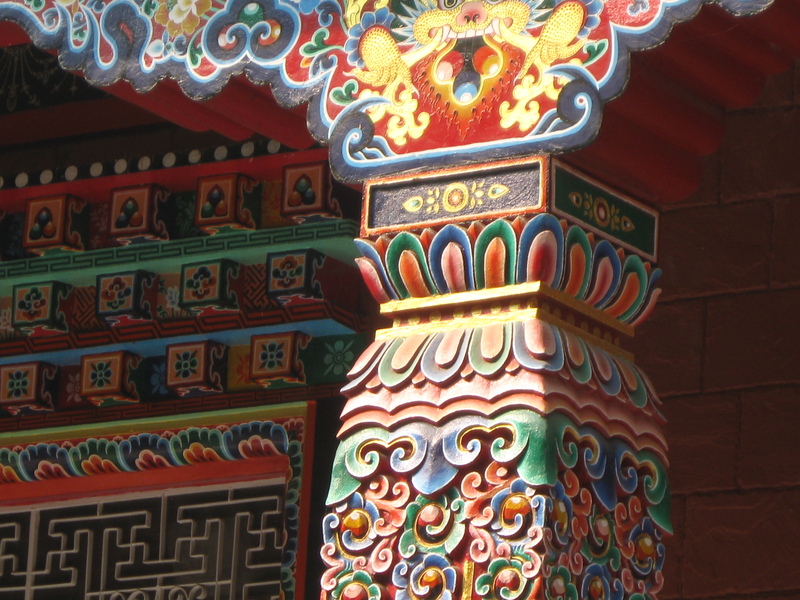 This town has Buddhist temples of every kind: Thai, Buttanese, Ethiopian, Vietnamese, Tibetan, Cambodian, each with it’s own distinctive architecture. 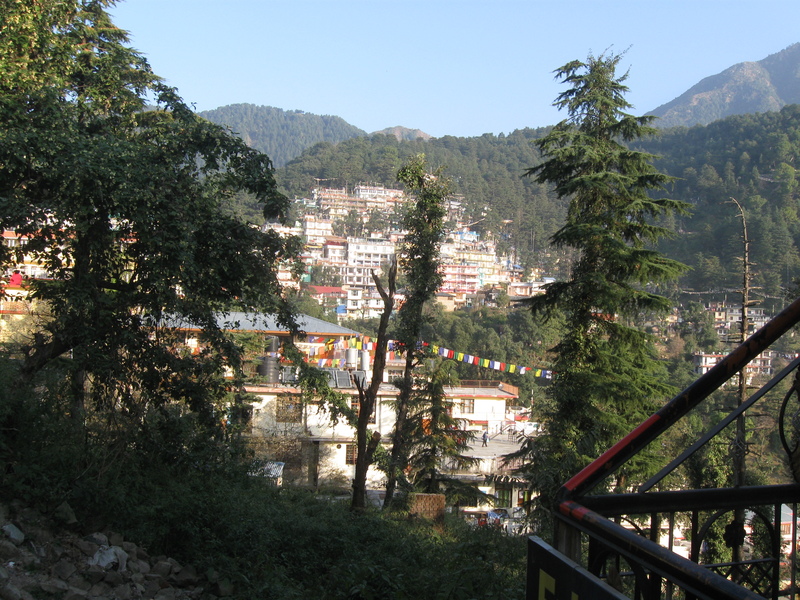 Our room overlooks the Tibetan Temple, where the monks chant and blow horns and bang drums every afternoon. In the night I try to get comfortable on the mattress. Outside, in the wee hours, groups of dogs have arguments that wake flocks of birds roosting in the courtyard. They tweeter and squawk for a while and then go back to sleep. Would that I could do the same. We rise before dawn each day for intense, sweaty mornings at the Mahabodi Temple where the descendant of the Bodhi Tree grows. As we walk to the temple, children come towards us in the darkness – little girls with outstretched hands and murmered pleas, and vigorous eight-year old boys pushing maps, cards, malas, flowers, and other trinkets. 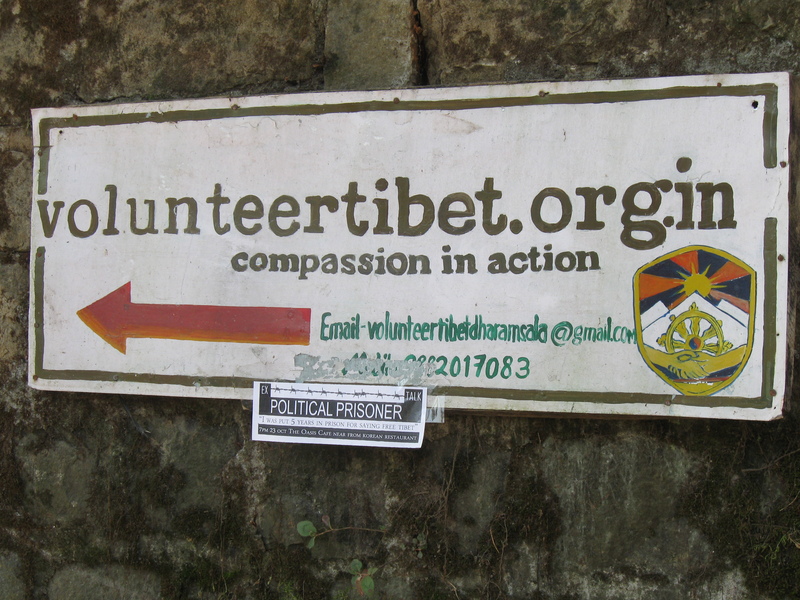 Inside the compound, the place swarms with Buddhist pilgrims and monastics of every stripe and color. 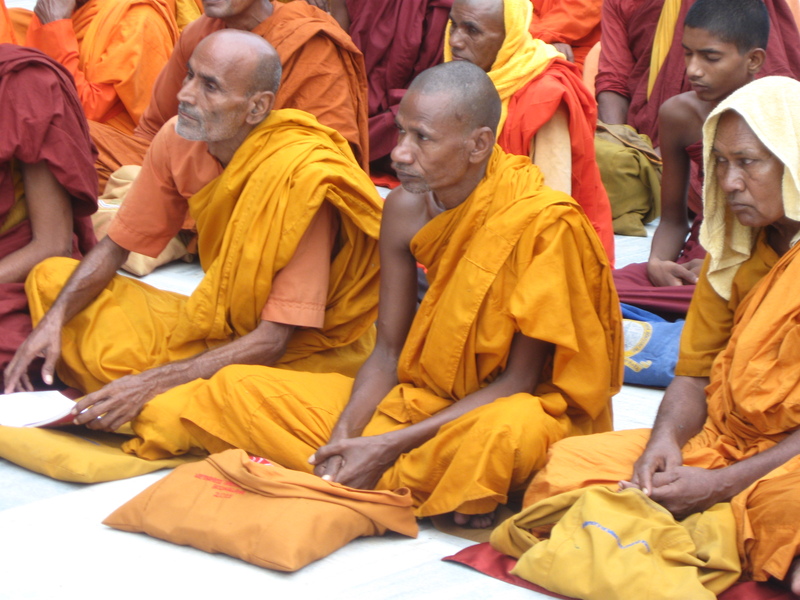 One morning we occupy a corner for chanting and meditation. The pilgrims ambulate by in waves. Since I’m on an outside corner, I’m lightly brushed by the passing throng. There’s a group of white-dressed women led by a regal leader with a complicated Dr. Suess-y headdress and a gold fringed parasol. Their loud speaker blasts out a chant that sounds like SA-DU-PA! I slide into “listening to world sound,” immersing myself in the bath of drumming, chanting and clanging of bells that surround me. Finally I’m practically dizzy with Buddhist overload. Waiting till it’s time to leave, I sit on a ledge and watch the bare feet walk by, while an ant skitters across the tiles, trying to avoid being stepped on. Long bus ride from airport. Color and dust. Must get used to feeling dusty, because that’s how I will spend the next three weeks. Also having my clothes smell like smoke. 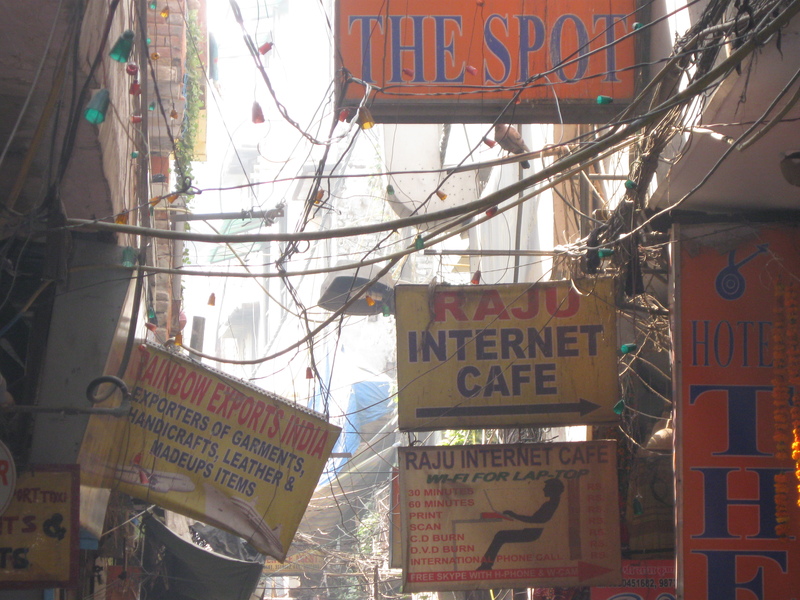 The restaurant in Delhi left my shirt smelling like an ashtray, and the hotel room smelled like a smoker had just vacated. At home this would have been unacceptable, and I would have requested another room. Here it’s just the fabric of life, along with the smoggy brown air. Nothing to get your knickers in a twist about. Mostly this is a good thing. It helps us get our bearings and feel more at ease. I liked that, therefore I will like this and be okay here. But there’s something to be said for experiencing a place that is entirely new and different. It hits the senses in a new way. 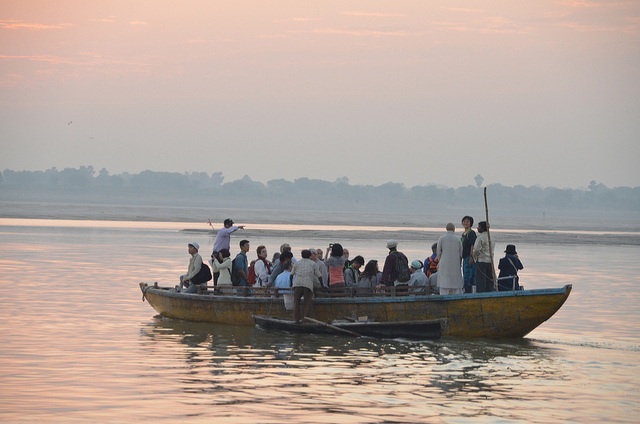 We got up at 4:30 this morning for a sunrise boat ride on the Ganges. After a short bus ride, we joined a dense crowd in the pre-dawn darkness, surging towards the ghats. I had to scramble to stay with the group, dodge traffic, puddles, and cowpies, and shake off persistent peddlers and beggars. The only effective response with this last category seems to be to completely ignore them. YOU DO NOT EXIST. I don’t like to treat people that way, but even a tiny head shake is taken as encouragement and intensifies their attention. Eye contact is out of the question. Finally arriving at the muddy river bank, we loaded onto three rickety wooden boats. My stomach was beginning to feel off. Is this because I took my malaria pill on an empty stomach or is it a visit from Delhi belly? Then I discovered that my camera batteries were dead. The ghats in Varanasi have to be some of the most wildly photogenic places in India. I’ve seen so many pictures and read so many descriptions, I’ve been expecting it to be the high point of the trip. And instead, here I am camera-less and queasy. 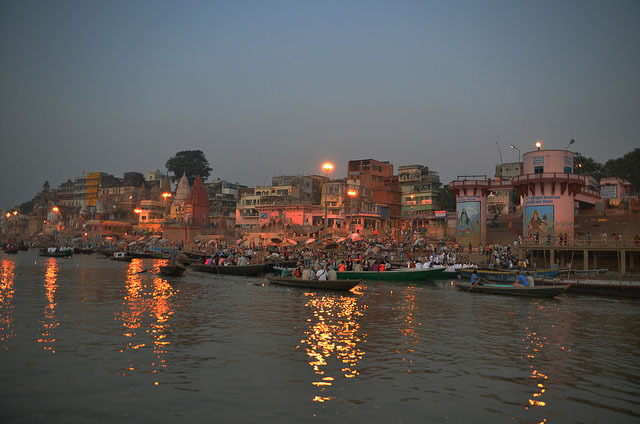 Dukka on the Ganges. Ah well. Perhaps it’s a blessing that I got this out of the way early on. From now on, we’re going places that I have no mental picture of, no expectations about. ~Try not to expect anything. In this way, everything will open up to you. In a few hours I’m heading up to Cambridge for the night, and then I’m off.